This is a beast of a Shinwa odachi that you absolutely have to see to believe. It comes in at a whopping 61 inches in overall length of sheer, sharp power. The 35 in. hand-forged blade is of beautiful, folded Damascus 1045 and 1060 high carbon steel going into a cast metal decorative tsuba. 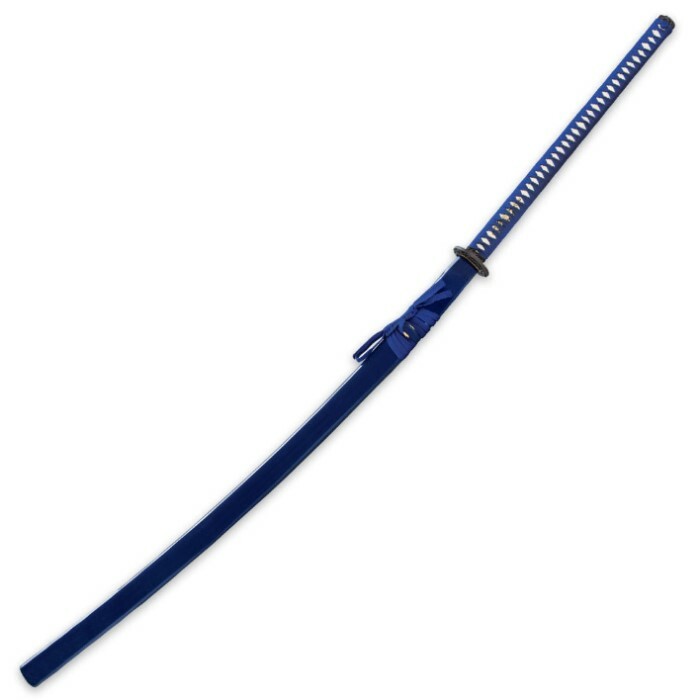 The handle is traditionally wrapped in blue nylon cord to match the blue lacquered scabbard. I bought this sword after I had bought one other shinwa Damascus sword. The quality is surprisingly good, it has a traditional tang and so far a strong sword. I would recommend it is a good sword. Just arrived and I couldn't be happier. It came quickly and mine came very sharp. It's hilarious when my wife stands next to the sword because it's taller than she is. I would recommend this odachi. At full price I would have to give this sword four stars and recommend with reservations. If you like large swords this is a steal. Pun intended. The blade on mine is true, Saya fit was snug but we could draw. The blade is sharp enough for light to medium temeshigiri based on my experience slamming blades into crap ( Mall Ninja since 1978, this is not my first "Japanese" SLO ) . I purchased this sword to learn how to care for and begin to learn to handle this style of blade. For display. Because. 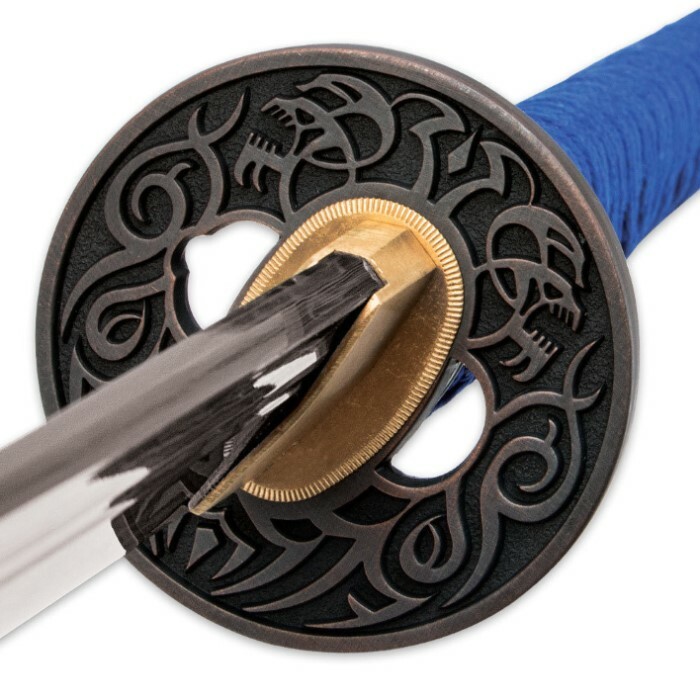 If you are a blade junkie of any sort this is an exceptional buy, for those who are serious students of Japanese based sword arts you will do yourself a favor by checking YouTube Reviews. This piece is a few simple modifications away from being a devastating Back Yard Cutter for those so inclined. Good sword, well made. Moderately sharp but not a big problem. Good blade and well built. Small rattle in the Saya when the sword is sheathed. Sword itself is full Tang and solid. Nice wrapping and ray skin on the handle. Shinwa swords have some QC variance in the sharpness department, but all are at least moderately sharp when delivered, i.e. will cut paper but with minor resistance. Well made and attractive. Good for cutting bottles, tatami mats, etc. I imagine I could kill horse with it too as these were originally made for. Don't try to chop down trees with it, that is just stupid and abuse of a sword. 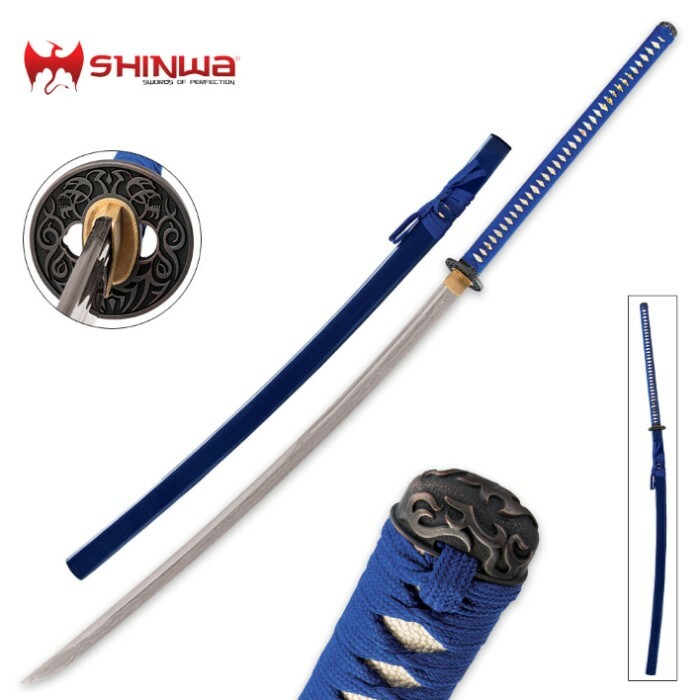 I cannot understand why this Sword cost less than the other two Odachi Swords by Shinwa. It is the only one of the three that actually list two different metals being forged together to create the finished Blade! It is easy to determine that it is True Damascus! The fit and finish of the sword I received was excellent. The blade to handle pegs stick out a bit but are acceptable and would be easy to flush out if wanted. The blue and white color scheme may not look as sweet as if all black however the polished blade is beautiful in my opinion, much more so than the blackened blades! I admit I am not a true Sword person but being a collector of top quality Firearms and Knives, I do know what excellent fit and finish are. I have ordered a few Quality Swords from BUDK, all were quite nice but this one I truly believe is an undiscovered Treasure! As always delivery time was Excellent and the products were packaged well to prevent damage. After 14 Swords and Canes, I believe there will still be more in the future!